When it comes to color-matching lumber, there is no perfect way to do it. In fact, it’s nearly impossible. In addition to grain, which we discussed in detail in Part 1, there are many factors that impact the coloring of each board. Some of the major ones are weather, climate, travel, and sawing. Regardless of how you try to take precautions against them, the elements will change the color of a board. Wind, rain, and sun all prompt random color variations that eventually fade untreated boards to a silvery gray. A freshly milled board already includes plenty of color variation, and those variations change and deepen as newly exposed surfaces shed moisture. 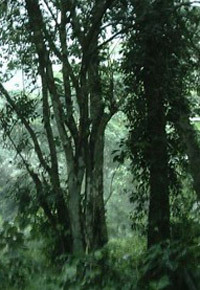 Climates and soil chemistry are two of the main factors tied to location that influence color. Consider Ipe and Cumaru, which both grow across an expansive region. Some regions produce more mineral streaking, and the soil chemistry can even change temporarily due to local fires or floods.In fact, dark streaks or other stark contrasts can be seen on either side of any major weather change. 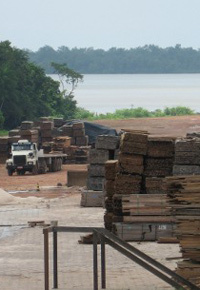 Tropical decking lumber endures some pretty tough travel arrangements. When you add to the already long journey a handful of extensive layovers and less-than-ideal accommodations, the boards don’t arrive at port in the best shape possible. Between the climate shifts and shipping scenarios — not to mention weather on the way — they encounter plenty of opportunities to get wet, dirty, and even stained along their travels. Once they arrive, they’re rarely given time to recuperate. Instead, they’re moved around by fork lifts for days before they’re finally moved to a lumber yard, where the situation isn’t much easier. As you can imagine, plenty of color variation can occur due to all that the boards encounter in their journey. Often, all they need is to be cleaned up, in order to reverse the effects of travel. 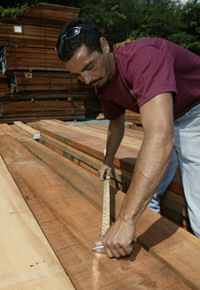 How the board is sawn from a log also contributes to how the grain appears and affects the coloring of the board. 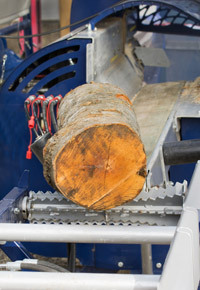 Whether the board comes from the center or the periphery of a log also contributes to the coloring and the density of the fibers. Rift-sawn or Quarter-sawn boards display parallel grain, but even those include some variations. The denser material you see is referred to as Medullary Rays appearing on the face; sometimes the result is a board with a striped appearance, and other times it’s a board that’s darker entirely. In addition, the end grain of a board is always darker than its face. By now, you may be ready to forget color-matching and just paint it and be done. Wait! Make sure to read Part 3 before you take drastic measures that you might regret. Since 1798, when Hugh McIlvain established a lumber business near Philadelphia, the McIlvain family has been immersed in the premium import and domestic lumber industry. 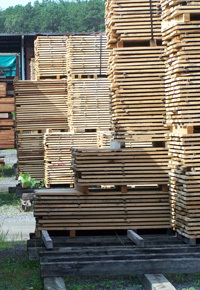 With its headquarters located just outside of Baltimore, the J. Gibson McIlvain Company (www.mcilvain.com) is one of the largest U.S. importers of exotic woods. As an active supporter of sustainable lumber practices, the J. Gibson McIlvain Company has provided fine lumber for notable projects throughout the world, including the White House, Capitol building, Supreme Court, and the Smithsonian museums. Genuine Mahogany vs. African Mahogany: What's the Difference? What Is So Great about Teak Wood? Is Your Teen Diagnosed with Reactive Attachment Disorder? Ipe Decking: Should you use Face Screwed or Hidden Fasteners? First Impressions: What’s More Important Than What You Wear?